With renal scintigraphy, the relative amount of the radionuclide extracted from theblood by a kidney is proportional to that kidney’s function, also called its glomerularfiltration rate (GFR). Both anatomic and functional information can be obtained using renal scintigraphy. Other imaging techniques like diagnostic radiology and ultrasound are superior for determining the structural or anatomic details of the kidney but neither technique measures kidney function. 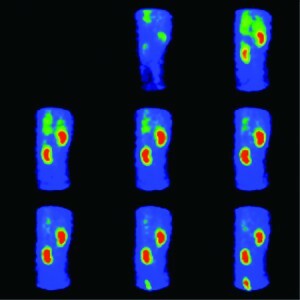 Quantitative renal scintigraphy is unique in its ability to rapidly and noninvasively measure individual and total kidney function (GFR) in the awake animal. The protocol for quantitative renal scintigraphy requires that the patient lie on its side for less than 10 minutes during which time the radionuclide is injected and images of the kidneys are acquired by a gamma camera and stored in a nuclear medicine computer for later analysis. By measuring the amount of radionuclide taken up into each individual kidney the computer can determine the kidney’s glomerular filtration rate (GFR). Renal (kidney) disease is one of the most common illnesses affecting veterinary patients. The types of diseases that can affect the kidneys are numerous and include infection, neoplasia (tumors), cysts, nephrolithiasis (kidney stones), injury from toxin exposure (antifreeze, aspirin, acetaminophen, ibuprofen), as well as a number of inflammatory diseases (glomerulonephritis, systemic lupus). Successful management of these diseases depends in part on the ability to measure the extent of disease before and after treatment. While blood tests and urinalyses can measure the total renal function (e.g. the function of both kidneys combined), they do not allow us to measure the function of an individual kidney. In some circumstances the ability to measure individual kidney function is of dramatic importance. These circumstances usually involve an anticipated nephrotomy (surgically cutting into a kidney, i.e. to remove a stone) or nephrectomy (the surgical removal of a kidney, i.e. to remove a tumor). Under normal circumstances all animals have enough extra kidney function to survive with only 1 kidney. Unfortunately this is not always the case in patients with renal disease. 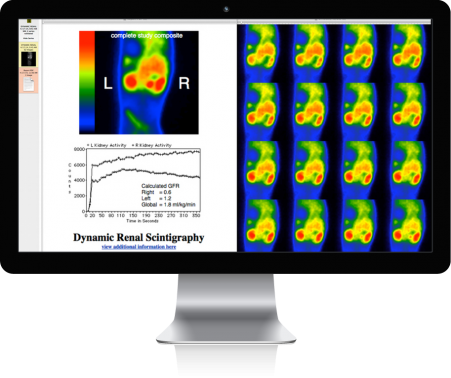 Quantitative renal scintigraphy is a valuable tool to assess the renal function that will remain following these types of surgical procedures. The knowledge of how each individual kidney is functioning can dramatically affect the plans to surgically remove a kidney stone or remove an entire kidney damaged by infection or tumor. 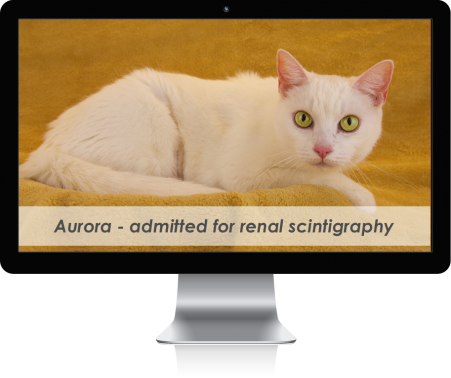 Quantitative renal scintigraphy requires no sedation or anesthesia and can be performed on an outpatient basis (no overnight hospitalization is required). Figure 1. Schematic drawing of the normal location of the kidneys and urinary bladder. The blue circle represents the gamma camera's view. Figure 2. 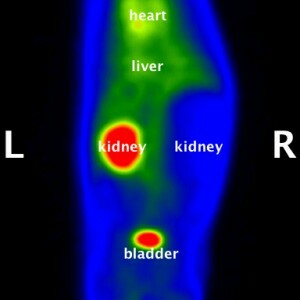 A series of dynamic images demonstrating the rapid uptake of the radionuclide by normal kidneys (red) in this dog. By measuring the amount of radionuclide uptake into each kidney, the exact kidney function (GFR) can be calculated. Also note the radionuclide in the urinary bladder in the last 2 images. Figure 3. 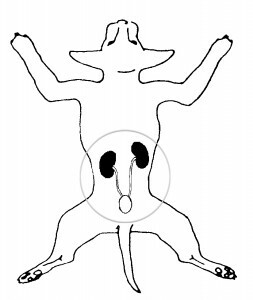 Composite image of a cat showing the uptake of the radionuclide into the normal left kidney. The small, poorly functional right kidney is also visualized within a large peri-renal cyst.